£5 of food to last for 5 days. This year saw my budget for Live Below the Line slashed in half. Previously, I’ve had the relative luxury of £10 to spend to feed two of us for five days. This time round my husband is bowing out (new job), so it’s down to £5 just for me. The hardline approach means I’ve had to wave goodbye to tea bags, multiple meals from a cheap chicken, and the flour, yeast and baking spread that would have made bread, pastry, pancakes, fritters and yorkshire puddings. And scones. And possibly pasta. Sob. The rules of the challenge insist on including the full price of packets or jars, unless you’re part of a team. This means that I have to budget for an entire jar of marmalade, pack of oats and bag of rice, even though I’m well aware I won’t polish off the whole lot in 5 days. Total: £4.97, leaving a few pence for salt, pepper and spices from the storecupboard. I’d be stitched on Live Below the Line with the value ranges. They’re vital for staples like rice, pasta, bread, jam, tinned tomatoes, tinned beans and tinned fruit when you only have a £1 a day to spend. Whether it’s Morrisons M Savers, Sainsbury’s Basics, Tesco Everyday Value, Asda Smartprice, Aldi Everyday Essentials, it’s worth scrabbling around on the bottom shelves in the supermarket. 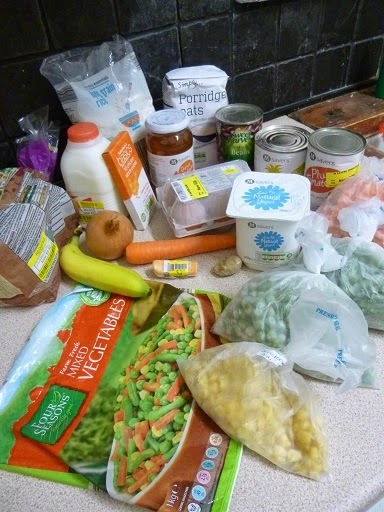 Even the value ranges vary between supermarkets, so it’s worth comparing prices on www.mysupermarket.co.uk . You can switch your basket of food around between Tesco, Asda, Sainsbury’s, Morrisons and Aldi, but unfortunately there’s no info for Lidl. When every penny counts, you’re less likely to go hungry if you can plan your meals and write a shopping list. I did a lot of crossing out and rewriting before I ever left the house, and it helped avoid buying items that were cheap but wouldn’t actually make a meal. It’s worth carving out something to provide a lift, even if it’s only 20p to 30p on a jar of jam, a packet of biscuits or tea bags. I focused on foods that would hopefully fill me up for longer – like oats, wholemeal bread, beans and eggs – rather than the crash and burn from white bread, white pasta and cornflakes. After the truly nasty cheese slices last year, I also tried to avoid cheap processed food (e.g. value baked beans or curry sauce) in favour of food I knew I definitely liked and would fill me up (fruit, veg, natural yogurt). Living on cheap bread / pasta / rice / oats can quickly descend into a mass of beige blandness when you don’t have enough for salt, pepper and the occasional spices. I opted for cheap stock cubes (25p – 30p). Root ginger is one of the few decent flavours that can be bought really cheaply, as even a bulb of garlic or a single lemon can set you back 30p. Finding yellow-stickered bargains in the reduced section, whether a dented tin of tomatoes, or short-dated eggs, milk and bread, definitely helped crowbar more onto my shopping list. Unfortunately it’s only really possible to take advantage of food near it’s sell by date if you’re lucky enough to have a freezer and storage space. Usually it’s cheaper to buy fruit & veg loose, so it has to weighed, rather than small bags of fruit and shrink-wrapped veg. The only way I could afford any fresh fruit and veg was by buying an individual carrot, onion and banana, and searching for the smallest ones. Luckily my local Morrisons has a set of scales in the fruit and veg aisle, so I could check whether it might be too expensive before reaching the till. One of the restrictions with a tiny budget is that you can’t afford the bigger packs that are cheaper per item, like big sacks of potatoes and onions, and big bags of fruit. In general, keep an eye on the cost per kg and it’s always worth checking out Aldi’s Super 6 offers. I was resigned to a cheese-free diet, faced with a chiller cabinet full of enormous blocks of shrink-wrapped cheese. However the staff behind the deli counter at my local Morrisons were kind enough to cut a tiny bit of cheese to liven up one meal. I’m not sure I’d be brave enough to keep asking week after week though, yet another reason to be grateful that for me LBTL is only for a limited time. I am more than aware of the ridiculousness of using 5 shops to spend as little as £5, let alone any issues about petrol costs/bus fares and the time taken. However, if you know particular items are cheaper in certain shops, and you can nip in when passing or stock up from time to time, your money will go further. Discovering that the cheapest bag of porridge oats at Lidl was 39p, as opposed to 75p at Morrisons, makes a big difference when you only have £5 to spend. Morrisons and the Co-op dominate my LBTL shopping list because they’re within walking distance of my home, whereas Lidl, Aldi and Sainsbury’s are a bus ride away. If I could only go to a single shop, I’d be caught between Morrisons and Aldi. The only way I could get anywhere near a something that tasted OK and was vaguely healthy was by cooking from scratch rather than relying on cheap ready meals. However, I am fortunate enough to have the time, experience and equipment to cook, and the money to pay the fuel bills, things denied to millions of other people worldwide. I’m doing the Live Below the Line challenge from 26 to 30 April, feeding myself for £1 a day for 5 days, in an attempt to help combat global poverty and raise awareness of the billions of people who go hungry every day. What does your food bank actually need? Good luck with the week, I'm starting a day late this year due to a family funeral yesterday so I can follow your progress and perhaps steal a few tips.